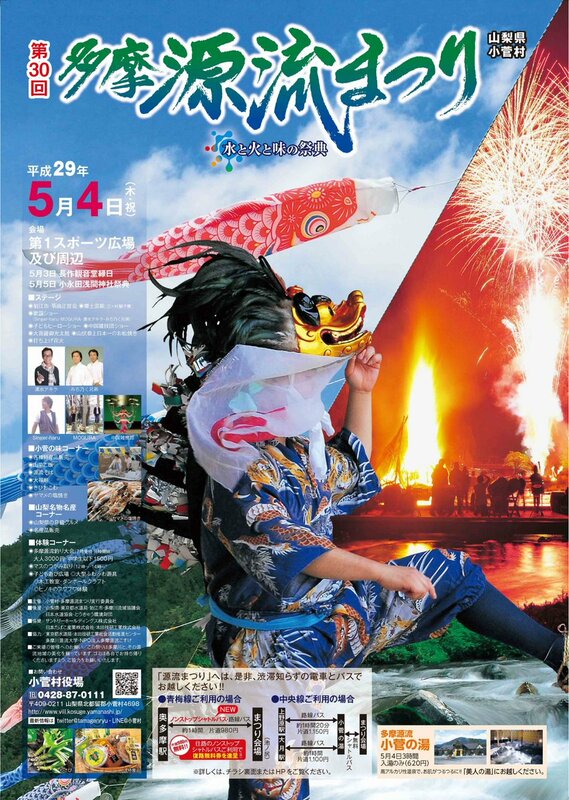 What: At the source of Tokyo’s famous Tama River, in Kosuge Village there is a large-scale event: Tama Genryu Matsuri 多摩源流まつり (or Tama Headwaters Festival). 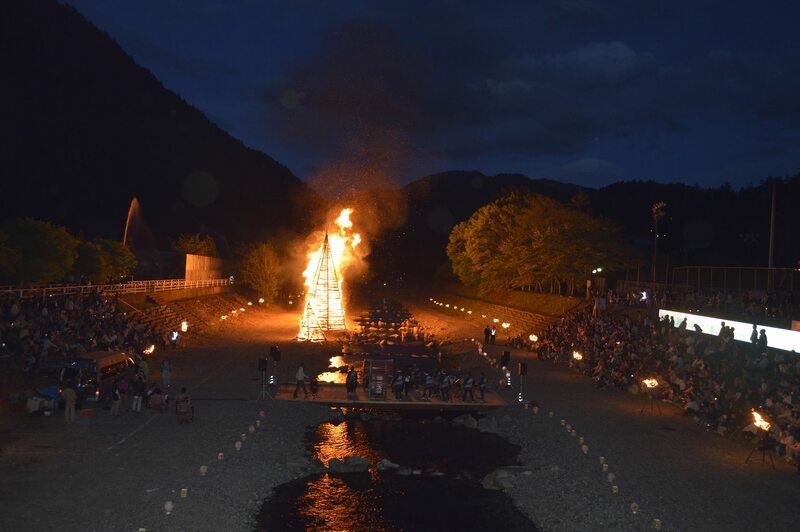 It is a water, fire, and taste festival held every year on May 4th. More that 10,000 people crowd this festival put together by the villagers every year. At the venue, not only can you enjoy the culture of Kosuge Village, but also the cuisine and local performing artists of the Tamagawa River Basin. 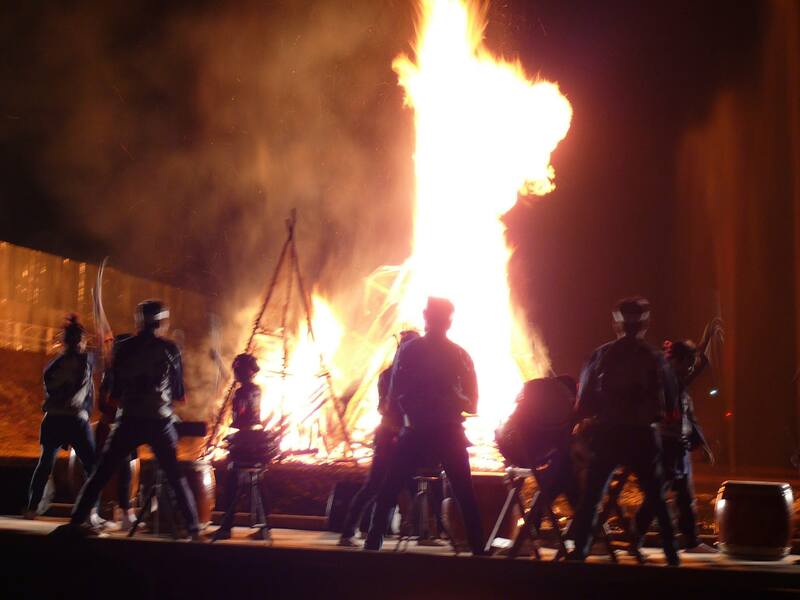 In the evening, yamabushi (mountain monks) ignite Japan’s biggest omatsuyaki (お松焼き), a wood pyramid covered in pine leaves and topped with bamboo, on the bank of Kosuge River. Also in the area, a pair of 200-meter carp streamers strung across the mountain valley swim graciously over the sky to welcome visitors. 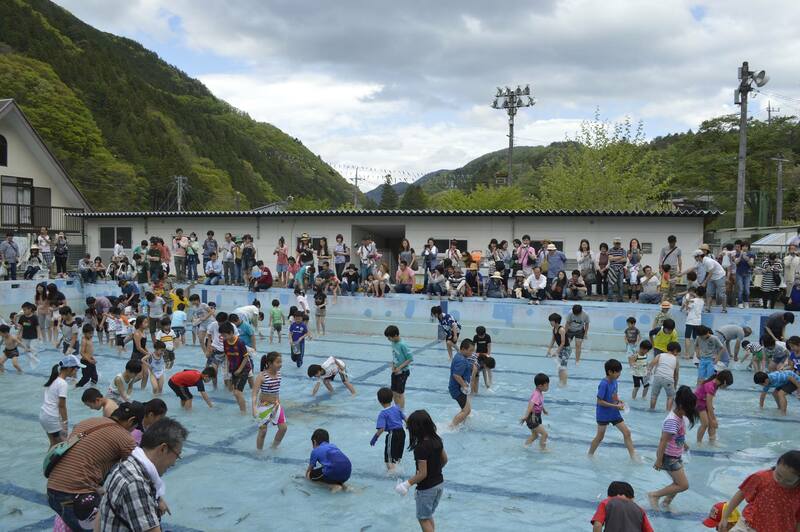 So by all means, bring the whole family to Kosuge Village during Golden Week! There will be many stalls selling food and local specialties including a corner for Yamanashi Prefecture’s specialty products. There will be a live Uchu Sentai Kyuranger (Power Ranger) show. If driving, parking will be limited, but there are several overflow parking areas including: the elementary, jr. high, and road station. Please follow those directing traffic. Ikenoshiri (池ノ尻) bus stop is just across the river from the venue. In addition, the regular Nishi-Tokyo Bus will run as usual, but it will not offer a free return ticket. The Fujikyu-Yamanashi buses from Uenohara and Otsuki will also run as usual. These buses do not stop at the venue. They go to Kosuge no Yu (the hotsprings). A free shuttle bus will operate between the Kosuge-no-Yu/road station and the venue. For more access information, see the general access page.